This story was published on page A1 of The Advocate on July 29, 2012. It was the sixth part in the paper’s series ‘A Community at Risk’ which looks at why Baton Rouge is one of the nation’s most violent cities. This story examines the role law enforcement plays in the crime rate and how the community’s distrust of police hampers murder investigations. Gertrude Cobb still does not know who shot and killed her son more than two years ago. David Cobb, 16, was shot during a party at a BREC park on Woodpecker Street on March 27, 2010. A fight broke out and bullets started flying, one of which hit Cobb in his spine. He later died in a hospital. The party had attracted hundreds of people over several hours, Gertrude Cobb said. Despite the potential for eyewitnesses, the case has gone cold in the Baton Rouge Police Department’s file. “There were too many people out there not to know what happened,” Cobb said, her voice breaking. The silence surrounding David Cobb’s slaying illustrates a struggle common to many homicide investigations in Baton Rouge. Police say they need the public’s help in finding murder suspects, but the public, for various reasons, won’t always cooperate. Among those reasons are fear of retaliation for “snitching” on friends, which Gertrude Cobb said she believes is happening in her son’s case, as well as fear of getting involved, and apathy. Many people simply distrust law enforcement. Police Chief Dewayne White, who acknowledges many residents, especially black residents, don’t trust his department, says it is time to try something new: forging personal relationships between his officers and the people they serve. The objective is to break down the “us versus them” mentality that sometimes exists on both sides, he said. On April 17, Linda Williams, 48, had just sunk into her couch after a long shift at Wal-Mart when she and her husband noticed a line of police cars outside their West Grant Street home and their two sons lying facedown on their driveway. When the Williamses went outside to ask what the problem was, an officer charged at them, cursing them and threatening to take them to jail if they didn’t go back inside, said the couple, Darrell and Linda Williams. The couple’s sons, Montreal Williams, 25, and Demarcus Williams, 24, both of whom work in their father’s landscaping business, said the officers kicked them in the head and back, and threatened to shoot them. One of the boys had some marijuana in his pocket. Montreal Williams said the back injuries he sustained in that incident now make it hard for him to walk some days. When Linda Williams called the Police Department’s Internal Affairs office the next day to file a complaint, she said, the clerk who answered told her that unless she had photos or a video of the alleged abuse, her complaint would go nowhere because the investigation would favor the officers’ account over hers. Williams said she never filed the complaint. A feeling of being disrespected is what prompts most of the calls made to the National Association for the Advancement of Colored People about police mistreatment, said Kwame Asanté, president of the Baton Rouge chapter. His office each month receives between one and three complaints about police, he said. That’s a far cry from just two or three years ago, when his office would receive 10 to 15 complaints a month, most of them alleging police brutality, he said. Asanté, who said he felt compelled to join the local NAACP in 1989 after multiple Baton Rouge police-involved shootings of young black men, lauds the dramatic improvement in both the number and type of complaints reported to his office. He attributes the change to White’s efforts to make the force more professional. “The way he is pushing his police officers to communicate what they’re doing in interacting with the community has made a big difference,” he said. Usually when residents call the NAACP to report a police complaint, Asanté said, they don’t end up filing a formal complaint with the department’s Internal Affairs office. “What happens is, people feel the officers are segregating them or treating them differently because of the color of their skin, so they don’t feel comfortable calling another white officer to talk about it,” he said. The trust issue in Baton Rouge is indicative of a long-standing national problem, particularly among black communities, said Kenneth Bolton, head of the Department of Sociology and Criminal Justice at Southeastern Louisiana University. C. Denise Marcelle, a councilwoman whose District 7 includes some of the highest-crime areas in East Baton Rouge Parish, recalled an incident in the past year when police officers kicked in a door of a house on Frey Street during a drug search. Police not only broke the door, but also pointed guns at the couple who lived in the home. The problem, though, was that the police barged into the wrong house. The even bigger problem, Marcelle said, is the couple didn’t report the incident. “They told their pastor,” she said in disbelief. White confirmed that he went to the couple’s home and apologized, and even bought them a new door. But even with the door repaired, Marcelle said, the stigma will last a long time. “How can I then come back — when three weeks later somebody gets shot out there or somebody gets robbed out there — and ask these same people to help me, to help the police?” Marcelle said. That perception of disrespect is also shared by some white residents, such as Eric Arnold, 23, a fast-food worker who says he has been stopped without cause several times by police. One such incident happened June 26 when, Arnold said, he called 911 to report a fire in the downtown area. Later, he rode his bicycle back to the scene. On the way, Arnold said, he was stopped by three police officers and frisked to see if he had been involved in a nearby burglary. He said the officers were rude and disrespectful. “How is it that a regular citizen like me, who pays taxes and tries to help emergency personnel, gets treated like this?” he said. However, he said he did not file an official complaint with the Police Department. According to a list of statistics provided by the Police Department, 277 formal complaints filed by the public between 2009 and 2011 led to internal investigations. Of them, 150 were not sustained, meaning they were found to have no merit. A list provided by the East Baton Rouge Parish Sheriff’s Office shows 91 complaints were formally investigated between January 2010 and May 2012. Of them, 40 were not sustained, or were found to have no merit. The rest were either inconclusive or are still being investigated. The lists do not provide information about punishments handed down for the sustained cases, which total 89 for the Police Department and 43 for the Sheriff’s Office. Citing the state’s public records law, The Advocate on May 16 asked to inspect written summaries of all the complaints filed against officers with the Police Department and deputies with the Sheriff’s Office from 2009 through 2011. To date, only 30 of the 300 complaints filed against the Police Department have been released to the newspaper. As a result of the request, the Sheriff’s Office released its list of internal investigations with a brief description of each case and its result. Cpl. Tommy Stubbs, a Police Department spokesman, said the process, being handled by the department’s legal division, will be a lengthy one because of the size of the request and the sensitive nature of the documents, which will require deleting information allowed by law to remain out of public view. “Only a handful of individuals in the entire department are even allowed to view these cases in their original forms,” Stubbs said. In the aftermath of Hurricane Katrina in 2005, complaints against police escalated. Asanté, the local NAACP president, said his office received 75 police brutality complaints in the seven days following Hurricane Katrina. New Mexico and Michigan sent state police troopers to help Baton Rouge police patrol a city swollen with evacuees. But after a few days, the visiting officers packed up and left, complaining that local police violated people’s civil rights, harassed black people and resorted to unnecessary violence. After an internal affairs investigation, Baton Rouge police announced in 2006 that one officer was suspended, one was reprimanded and three were referred for counseling. Police said they found no evidence of the more serious allegations but said the out-of-state officers who complained were not interviewed, claiming the officers’ respective agencies refused to allow the interviews. However, both out-of-state police agencies said they were not contacted by Baton Rouge police for such interviews. The U.S. Justice Department confirmed in March 2010 it was investigating the case, but closed its investigation in January 2011 without an explanation of its findings. When Alex Robinson’s 18-year-old son, Carlton Alexander Smith, and his friend Irise Blakes, 19, were shot and killed Jan. 31 at the intersection of East Fairlane Court and Maplewood Drive, none of the neighbors would admit to investigating officers to having heard the shots, much less provide a description of the assailants. Only ShotSpotter, the city’s network of acoustic monitors used to detect gunfire, picked up on the shots, the Sheriff’s Office has said. After a few months and a lack of tips, the double slaying was designated a cold case, Robinson said. “You can go out and kill someone and you’re not going to get caught unless the police catch you in the act or someone else goes confessing,” he said. One reason potential witnesses won’t talk, some officials say, is fear. Sid Newman, executive director of Crime Stoppers, a private organization that offers financial rewards for valid anonymous crime tips, points to the case of Denako and Dearius Duheart, two brothers accused in the murder of Jason Fourmy in 2007. The Duhart brothers’ charges were reduced several times and ultimately dropped in 2009 after three witnesses in the case were shot to death. No one has been arrested in those deaths. White said fear is about “80 or 90 percent” of the reason people won’t call about crime. He said they feel they can’t expect police to protect them. Bates, the retired police department chief of staff, said many people don’t report crimes because they just don’t want to get involved. White says negative headlines outweigh the positive things officers do, like breaking up drug rings and solving murder cases. The police chief acknowledged there are times when his officers do not act as compassionately as he believes they should, saying they are overworked because the department is understaffed. 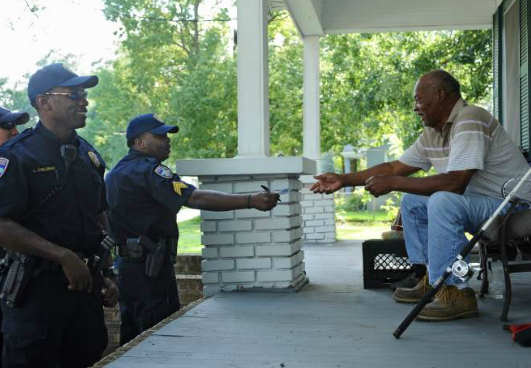 Amid the roughly 230,000 calls for service and 150,000 crime cases Baton Rouge police handle each year, White said, his officers don’t have the time to talk to people in the community, let alone devote entire units to community outreach, as the Sheriff’s Office has done. Even after increasing patrol officers by 8 percent in the past year, White says, he needs another 174 to reach his desired total of 550 patrol officers. White, whose office has received funding for police academies in 2011 and 2012, has said he will ask for 75 more officers next year. Others, like Marcelle, however, dispute the idea that the Police Department doesn’t have enough officers or time to engage with the community. Cpl. Darryl Honore, who patrolled city streets for 15 of his 17 years on the force, emphasized that policing a violent city like Baton Rouge takes a devastating toll on an officer’s psyche, making it hard to remember that the majority of people out there are still good people. Sheriff Sid Gautreaux said he understands his officers deal with high-stress situations on a daily basis, but nobody made them put on the badge. The “us vs. them” mindset is partially based on one side working for a living versus living on the dole like a bunch of leeches. One can look back to Lyndon Johnson’s War on Poverty in which the democratic government in power felt that giving people money to sit around at home, drink beer and smoke cigarettes, while they spawn more little democrats, translated into votes designed to keep the democrats in power. Pandering to this lower class will always foster discontent among good,hard working class people who have watched their tax monies squandered on buying democratic votes, with their hard, earned funds. I am not a religious person but I can see the wisdom in passages attributed to Jesus such as “He thatg does not work, neither shall he eat.” Very ironic when you consider that by and large when we observe many of these “disenfranchised poor” they seem to be overweight. I would speculate that is the result of sitting on their posterior while doing nothing.